On their first album as a trio, Korpos Lithos (Multikulti Project, 2009), and on their new album of free improvisations, A Quietness of Water, Peter Evans, Agustí Fernandez, and Mats Gustafsson borrow their song titles from the American poet Robert Creeley. Creeley makes an interesting, and apt, muse for these musicians. For some, Creeley’s poems, despite their direct and simple beauty, lack the traditional moves they presume a “good” poem ought to make. Once, after a poetry reading, a puzzled audience member asked Creeley, “Are those real poems, or did you just make them up?” A Quietness of Water also puzzles at first, and might make one to wonder: “Is this real jazz, or are they just making it up?” The answer to such a conundrum is: keep reading; keep listening. The answer is yes; yes. On the album’s first cut, “Once in a Rented Room,” Evans’ trumpet sounds like an Egyptian mizmar, a euphonium, a wounded animal, warning sirens. When he emits a hellish growl, one fears it may be, in fact, a howl from one’s own unconscious primal depths. Evans, at once, sounds like an air raid siren and a dive bombing kamikaze. He hums into his trumpet like a kazoo. He tongues the mouthpiece. He plays the spit collecting in the tubes. He holds a note past normal human capacity while its microtonal changes mess with our desire for resolution. And that’s just Evans. Fernandez pounds the piano keys occasionally, but mostly he is inside the piano, rending it like an industrial combine at a metal recycling plant. Gustafsson puffs, grunts, and desperately inhales and exhales through his stops. Next, on “Persistent Hope,” Fernandez’s eerie scrapings remind us a haunted house. Gustafsson woo-wooo-wooos like a ghost. Evans’s trumpet whirls like a Hammond organ with a Leslie speaker playing the soundtrack for an old silent movie. Then things really get weird. The sax and trumpet snarl at each other until an entire angry animal kingdom wakes: elephants roar, zebras whinny, monkeys whoop and screech. For a moment, things calm down, yet soon enough the whole haywire jungle machine goes nuts again. There’s an end-of-the-world bedlam in the guts of Fernandez’ piano. Gustafsson sobs and wails and moans. Evans feeds back like a guitar flung in front of an overdriven Marshall stack. “I Speak to Hear,” the third track, puts us in the mind of a gentle rain, at first, then, after a bang like a gunshot, Gustafsson whoops and hollers, thwump-thwump-thwacking percussively. Together he and Fernandez beep-beep-flurp-squawk. Evans overblows his trumpet. It squeals like he’s letting air out of a pinched balloon. He plays long, lippy, rising notes, makes kissy noises, and plates saucy smorgasbords of sound. Gustafsson’s playing alternately sounds like an upright bass plucked pizzicato, or like his stops have transmuted into bongos. Evans veers from sounding like a Theremin to blowing through a mouthpieceless trumpet, pistoning the valves, whistling, and choo-chooing. On the fourth song, “Thoughts,” named after a tiny Robert Creeley poem — “Am I dying? / I am beautiful. / Either way.” — the trumpet and the piano sound, surprisingly, like a trumpet and a piano until the song begins to have too many simultaneous disquieting thoughts. They race and zoom. Gustafsson is a fog horn; Evans, an ocean liner sounding an alarm, which turns into thick static. Fernandez flogs the piano, which refuses to give up the ghost, even when it sounds like a downed powerline wildly jetting and sparking in the icy street. Gustafsson’s rather lovely, breathy solo transforms into thwumping and yelling as if he’s frightened by a nightmare. Evans blows through the trumpet which discovers it is a flute, whale song, a flock of ducks being mass murdered, and the suction tool at the dentist’s. The final song, “A Quietness of Water,” finds Gustafsson sounding almost like a cello section. Fernandez’s piano plinks like an autoharp or a hammered dulcimer or sprung springs. Evans’s breath through the trumpet is white noise, which for a moment pierces like an oboe, then turns into a pervert’s heavy breathing into the phone, a suitcase dragged across Berber carpet, a NASA radio signal fizzling before the crew is lost, a fire alarm, a Tour de France ambulance, a teakettle at the boil . 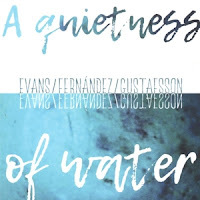 . .
As I listened again and again to A Quietness of Water, I noticed how often Evans reminded me of the flute section in the second movement of Béla Bartók’s Concerto for Orchestra, and how the trio, with all its manic bravura, suggests the entirety of an orchestra. There are emotional swarms that leave the imagination reeling, dark dramatic swells, trilling notes that float above the rest, hectic conflicts as if a violin section were bowing tremolo, and rumbles from bass drums like a dark night of the soul descending. There is vigor and joy; anguish and ambition. There are rude, blatting raspberries, terrifying explosions of sound, and an epic sweep. Which is to say, A Quietness of Water is, finally, beautiful. A Quietness of Water tantalizes us with its strangeness and its teasing refusals to satisfy what we thought we were supposed to expect—or even want. Evans, Fernandez, and Gustafsson wield a variety of extended techniques, playing their instruments in untraditional, unconventional ways. It isn’t so much that they are playing jazz as they play the trumpet, the saxophone, and the piano for all they’re worth. They ignore, or transcend, the expected uses not only of their instruments but of their breath and bodies. They smash the iconic twists and turns of the jazz tune. They are not producing “special effects”; this is just the way they play. It is how they say what they must say. Their songs exist outside plot structures. Their music develops circuitously, like thinking does, and when these three think together, things get too complicated for even a battalion of critics and therapists to unravel. This is pugnacious music. It affects its listener physically, physiologically. The song is an arena; the playing an event. Like all great music, it rewards a listener who listens carefully and often. It is a new translation of the language of “jazz” that requires immersion to develop fluency. Robert Creeley wondered, on a rainy day, “What am I to myself / that must be remembered, / insisted upon / so often?” A Quietness of Water asks equally existential questions. It poses problems about the nature of our desire for jazz and the ways we define it. It joins a profound improvisatory conversation that is unceasing. This is not music to “enjoy.” It defies usual satisfactions. It provides no rest for our perturbed spirits. This is jazz as experience—as pathos. I don’t know if there are aesthetic categories to judge whether the music or the playing are “good” or “bad,” but Evans, Fernandez, and Gustafsson leave me thinking that the music they make is beautiful because of the sublime ways they just make it up. Available at Not Two Records (http://www.nottwo.com/mw952), Instant Jazz, Downtown Music Gallery. Good stuff! The album is incredible - It really is just three guys playing their instruments for all they're worth.